Where lack of space dictates that neither a sliding nor a swing door can be considered, an automatic folding door provides an ideal solution. Its particularly compact construction makes this type of door the complete space-saver which is also perfect for retro-fitting during conversions or renovations. Smaller shops, smaller companies, filling station convenience stores or buildings with narrow entrances whether in large cities or historic parts of towns. The TORMAX pre-finished compact automatic folding door solution impresses as a result of its restrained and graceful appearance. 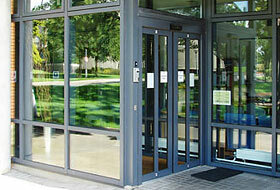 The door system is supplied completely prefabricated from attractively shaped special profiles. Aluminium profiles which can neither trap nor crush limbs or people and with integrated lip seals ensure a high level of safety and guard against drafts. A profile system developed by TORMAX specially for folding doors to accommodate various glass thicknesses from 8 mm toughened safety glass to 16 mm insulating glazing.